The horrendous damage and developing health problems that result from floodwaters or leaks within a home or business cannot be made right without professional flood mitigation experts. 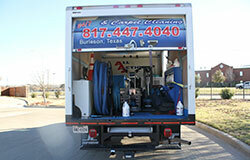 All Action Water Extraction & Carpet Cleaning, an emergency water damage restoration company in Burleson Texas is comprised of a team of specialists with the expertise and the essential industrial powered equipment that is needed to restore property ravaged by water from flood, burst pipes, storms and drainage problems. The experienced professional team and cutting edge equipment of All Action Water Extraction & Carpet Cleaning works fast to keep water damage and health risk from becoming permanent problems. Our team is standing by 24 hours per day and 7 days per week to answer calls for help in water damage recovery. Assistance is always professional and always quick. Mitigation teams can be on the job often within minutes of the request for help. A flooded home is dangerous and very stressful. The first action is to ensure the safety of yourself and your family. The next action would be to call the experienced and bonded team of All Action Water Extraction & Carpet Cleaning. Our mission is to return your home to a safe, comfortable and dry environment and we are proud to have the experience and equipment to make it happen quickly. As soon as we arrive at the site of the distressed property, the team gets to work. We bring everything needed on our specially equipped trucks. Water is removed with industrial power submersible gas powered pumps that remove enormous quantities of water fast. The water removal equipment scientifically monitors the moisture content so safe levels are identified immediately and the next step of the recovery process can begin. Once the water is removed from a flooded property, a super powered drying process follows. Heavy duty high-speed air movers are brought in to create airflow across walls, carpets, pads and furniture, evaporating moisture quickly before the water causes permanent damage such as swelling and warping of wood floors. The quick action saves precious furniture and walls. Infrared cameras locate moisture that is not visible and drying efforts are able to target unseen wet areas. 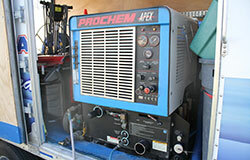 A disinfecting, enhanced drying and deodorization process follows the high powered drying task. The potential for dangerous mold and fungus growth is stopped dead in its tracks with sanitizing agents, germicides and anti-microbial treatments. Disinfection products stop the growth of bacteria, fungi, mildew, and other harmful microorganisms that cause dangerous illness. Finally, a professional cleaning is performed and the home or business is clean, dry and ready for occupancy. The All Action Water Extraction & Carpet Cleaning professional team stays on the job until the impact of flood water is completely mitigated and the home or business is safe and comfortable for living or working. We know the importance of the safety and security a home provides to a family. The loss of income for businesses and employees is taken very seriously. Our team is proud of its record when it comes to getting families back into safe, comfortable and healthy homes and businesses back into operation. Call All Action Water Extraction & Carpet Cleaning first when catastrophe hits. 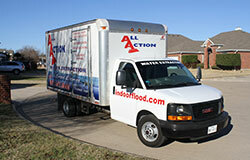 Give us a call at (817) 829-6628 and see how we can take care of all your water damage / flood repair needs!